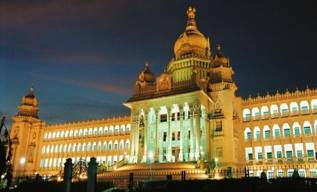 Bangalore the capital of Karnataka ranks as one of the fastest growing cities in Asia. Its pleasant climate, friendly people and its highly educated population have made this sillicon valley of India with almost all computer related multinationals setting up their Indian head office at Bangalore. This is the garden city of India with many gardens and boulevards. 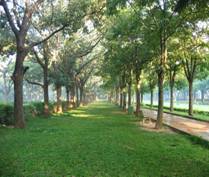 There are number of places of tourist interest in and around Bangalore. This land of scenic splendor Bangalore, is bordered by Mumbai in the North and by Chennai in the South. The history of Bangalore dates back to 1120 AD with the reign of Chola King.History dates back to Veera Ballalla who was the ruler of the deccan plateau.It so happened once when the king went for hunting into a forest,he lost his way and was not able to find his way back.After a long search he met an old lady in the forest who offered him shelter for the night and served him baked beans for dinner.As a token of love to this old lady the king built a nwe town and named it as Benda Kalooru which means Baked Beans.As years passed by a local chieftain Kempe Gowda helped in shaping this town to a modern one and named it as Bengaluru.During the rule of British they found it difficult in pronouncing this name and so it was transformed to Bangalore. Karaga Festival - This festival falls in the month of March-April and the celebration is very traditional.On the eve of this festival devotees carry an earthern pot on their head and go as a procession to the Sampangi tank where they immerse all the pots in the water and let go. Kadalekaye Parishe - This festival celebrates the groundnut crop of the year and it is popularly referred as peanut festival.It falls in the month of November.On this occassion the people visit the Bull temple to worship the God for good fortune in the coming years. Ugadi - This is a very important festiva of Karnataka for it is the Kannad New Year.The celebrity of this festival is Lord Brahma where the people begin the day with a ritual bath early in the morning,and comes to an end with prayers that continue late into the night.It falls either in the month of March or April. Varamahalakshmi - This is a very ancient festival dating back to Vedic age and falls in the month of August.Varamahalakshmi is mainly celebrated by married womans for the well being of their husband and on this day they worship Goddess Mahalakshmi and after the pooja they offer kum-kum to other ladies. Other common festivals celebrated high include Makara Sankranthi,Ganesh Chaturthi,Dussehra,Diwali and Mahashivratri. Banashankari Temple - This temple houses the deity of Amma from Badami and it was founded by Somanna Shetty, a devotee of Banashankari Amma.This is situated at a distance of about 13kms from the town. This is one of the oldest temple situtated in Basavangudi.Built for Nandhi,the sacred bull,the vehicle of lord Shiva. This temple has a 4.6 metre tall carved statue of sacred bull. This temple is situated to the west of the Chord Road, on a seven-acre hillock, known as the 'Hare Krishna Hill'.There is a magnificent main temple hall,which houses the altars of their Lordships Shri Radhakrishna-Chandra,one can see the golden chandelier that is shaped like an inverted lotus flower. 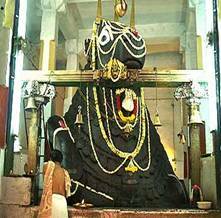 Sri Gavi Gangadhareshwara Temple -This temple houses the idol of Lord Shiva and is situated in the Gavipuram-Guttahalli, about 3 km from the City Market. Jama Masjid- This masjid popularly known as Sangian Jamia Masjid is situated in the K.R. Market area and is known for its architecture.This is the oldest mosque in Bangalore supported by ornate granite pillars. St. Marks Cathedral - This cathedral is situated on the busy M.G. Road of Bangalore. The foundation of this cathedral was laid down in the year 1808 and the construction work was completed in 1812. St. Mary's Basilica - This is situated opposite the Russel Market Square in Shivajinagar, Bangalore.This church is known for its ornate Gothic style church. The State Legislative and Secretariat House was built in 1956 in the Neo Dravidian style with granite entirely sourceda from the city itself. 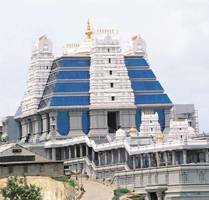 This imposing structure represents the best of Bangalore's monuments. Weekend illumination of the Vidhan Saudh is a great attraction for the tourists. 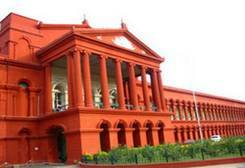 Directly opposite to the Vidhan Saudha is the State High Court. This magnificent building was constructed in 1857 in the Gothic style of architecture. 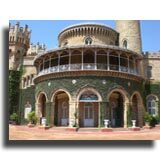 The Bangalore Palace was built in the year 1887 by the Wodeyar dynasty.It is built similar to medieval castles in Normandy and England.Its interiors boasts of elegant woodcarvings and Tudor style architecture. 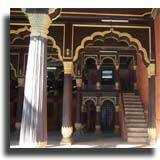 The palace was first constructed by Hyder Ali and completed by his son Tipu Sultan in the year 1791.Tipu called it as the envy of the heaven.It is constructed mainly in wood and has finely intricately sculpted arches surrounded by exquisite minarets. This park is located at a distance of about 22 km away from the city.Bannerghatta National Park of Karnataka is home to lions, tigers, panthers and various species of birds.There is also a Zoological Garden that boasts of an amazing collection of reptiles and a snake park. You can also see many mammals, like jackals, fox, leopards, fox, wild pig, elephants, sloth bear, sambar, hare, spotted deer, barking deer, common languor, bonnet macaque, porcupine and gar, in Bannerghatta National Park. This is one of the country's oldest art museums and this gallery houses many interesting antiques and archaeological objects. It remains closed on Wednesdays. This is named after the famous Sir M.Visveswaraya, am engineer par excellence who built many famous dams in Karnataka. This science museum houses models of machines. It is a highly recommended spot for children. Lieutenant General Sir Mark Cubbon laid out this beautiful park in 1864. Over 250 acres of this green park is just right for long walks and hosts a children amusement park, a doll museum and a toy train for children. This is in the south of the city.Hyder Ali laid out the Lalbagh gardens in the year 1760.It covers an area of 240 acres. The glass house inspired by the crystal palace in London is a favourite spot in Lalbagh which hosts the famous flower show during the month o August. This houses the state central library. This place has a rich collection of books. Fun World is a 12 acre Disney Land like amusement park, tucked into palace grounds. 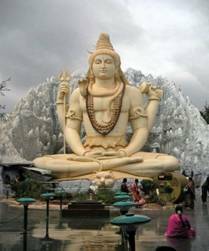 It boasts of a 65 feet high depiction of Lord Shiva seated in Lotus position. It has the backdrop of Mount Kailash the Lords heavenly abode and the river Ganga flowing from his matted locks as depicted in the mythology. This displays the life of the father of nation, Mahatma Gandhi with pictures and photostats of his letters. 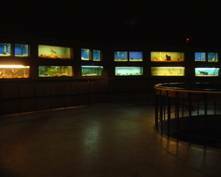 This is the second largest aquarium in the country and it has a large varsity of aquatic life. It remains closed on Mondays. Befitting the science city title that it carries, the planetarium is an interesting site for children. It remains closed on Mondays. Alankrita Antiques, Commercial Street How To Reach This Bazaar? Central Cottage Industries Emporia, M.G Road How To Reach This Bazaar? Kairali, M.G Road How To Reach This Bazaar? Bangalore International Airport has flights to all the main cities of India and also flights to many West Asian destinations as well as London and Frankfurt. Bangalore city railway station is an important destination in the Indian railway network with trains connecting to most parts of India. Bangalore is connected to some of the major cities of India through the National Highways NH4, NH7 and] NH48.